Ever wondered where all the different leaves in your bagged salad come from, and what they taste like individually? 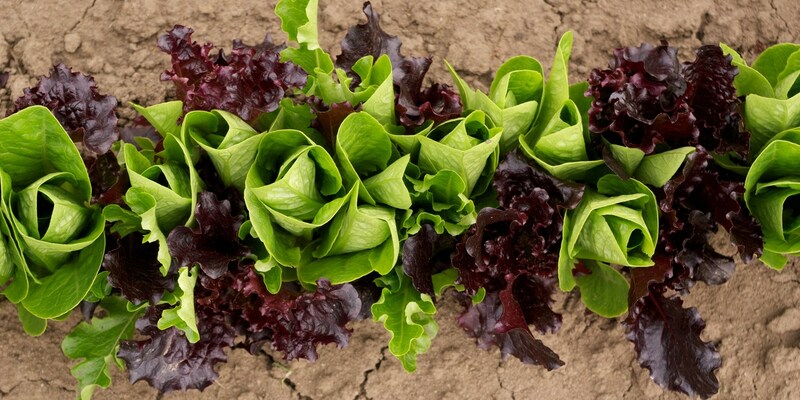 Read our handy salad variety guide and get to know your romaine from your radicchio. It’s every gardener’s dream to have day after day of perfect sunshine. We all know that without it, most plants (let’s forget about things such as forced rhubarb for a moment) can’t achieve the colour, flavour, vibrancy or appearance that better conditions would allow. This is especially true for salad leaves, which need a surprisingly specific environment to grow to their full potential. They require some form of heat – the first sign of frost will often wipe out most salad crops – but when it gets too hot the leaves begin to burn. It’s natural sunshine that makes all the difference to the final product. That’s why Europe is home to the best rays for salad growers. We often associate sunshine with tropical beach paradises like Barbados, but the scorching temperatures are too much for typical leaves. This is why in places such as Spain, salad growers will sow seeds in the mountains to avoid the rising heat of summer, and salad farmers in England can make the most of the UK’s sunshine when there's the perfect amount of light. Leaves that haven’t been grown in enough sunshine are easy to spot – they tend to turn yellow very quickly, are never as vibrant as they should be and break apart more easily. Despite requiring similar conditions to reach their full potential, salad leaves are incredibly varied. There are countless combinations of ingredients that can go into something as simple as a mixed leaf salad, and each leaf variety has a unique appearance, taste and texture that can complement other foods perfectly. Here are some of the most common salad leaves with a brief description of how they should feel and taste. Tastier, sweeter and more tender than curly kale, baby kale avoids the tough stalks and chewy leaves that can sometimes come with mature specimens. It can be wilted in the same way as spinach and added to hot dishes, or simply dressed raw in a salad. The leaves of the beetroot plant are often discarded when the vegetable is harvested, but they are a fantastic addition to a mixed leaf salad. They have quite a mild taste and are similar to spinach in flavour, but are more robust and firm in texture (a bit like kale). Chard is earthy, creamy and mild, and can be treated much like spinach when young. As the plant grows older, the stalks (which can come in a variety of vibrant colours) become tough and usually require cooking before eating. In salads, however, it is usually the younger leaves that are included. Incredibly fresh-tasting and sweet, can can is a delicate leaf that adds plenty of refreshing flavour to salads. It requires lots of water when growing, which means it has a particularly crisp texture when bitten into. A member of the chicory family, escarole leaves have a similar bitter flavour (although the inner leaves of the plant are more mellow and slightly nutty). This makes it a great all-rounder in salads when both the outer and inner leaves are used, with a satisfyingly crunchy texture. Curly, spiky and full of flavour, frisée ranges from yellow-white to dark green and has a full, bushy appearance. The bitter, peppery flavour combined with a robust texture means it can stand up to other ingredients well, and won’t wilt when served with hot foods. So-called because it supposedly tastes best during lambing season and looks a little like a lamb’s tongue, this leaf is very subtle in flavour and slightly sweet. It’s a popular ingredient to serve with strongly flavoured foods such as cheese, as it doesn’t overpower, but the bouquet of small leaves have a wonderful velvety texture that’s truly unique. Also known as Italian chicory, radicchio is vibrant red, crispy and has a bitter, spicy flavour. Apart from adding colour to a mixed leaf salad, it can also be served as an antipasti griddled then tossed in olive oil. Thought to have originated on the Greek island of Kos (hence the name), Romaine has been cultivated for almost 5,000 years. It has quite a mild taste with a slight sweetness, but is best used in salads thanks to its incredibly crunchy, crispy texture, which adds plenty of freshness and can stand up to dressings. The strong, peppery, spicy flavour of rocket is instantly recognisable and it’s a firm favourite in all sorts of dishes, such as stirred through pasta or wilted on top of pizza. It adds bags of flavour to salads and its spiky shape offers a bit of variety. One of the most common salad leaves used in cooking, spinach wilts beautifully and is used to add flavour, colour and nutrition to Indian and Mediterranean dishes (among many others). The leaves are just as good raw as they are cooked, with a sweet, nutty flavour and tender texture.